Well, if you know me or have spent more than 10 seconds on this blog in the last few years then I'm sure you can imagine how beyond-the-limit happy I am at this second. 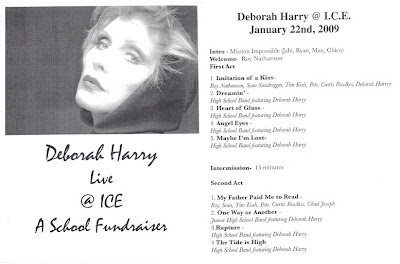 I just got home from a fundraiser for a school in the East Village, the Institute for Collaborative Education (ICE), that featured Debbie Harry playing some of her biggest hits with the students and faculty, including her former Jazz Passengers bandmate and Roy Nathanson, (THIS is why I wanted to grow up in Manhattan, Mom. 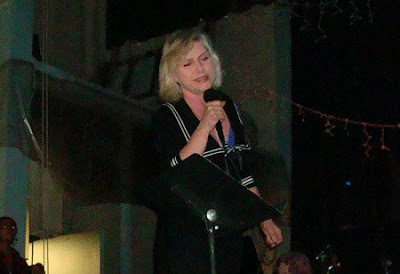 Debbie Harry NEVER joined the Rhodes Chorale -- not even once!) As if hearing "Dreaming" (a movie or a measure? you know how these New York liberals roll) , "Heart of Glass," "One Way or Another," "Rapture" and "The Tide Is High" performed by a high school band (with a little help from the junior high, too) with a group of girls singing backup weren't adorable enough, then Debbie came out into the audience and high-fived me during the finale. That is just so awesome and I am so happy for you. She is an icon and a true talent and I love that you met her and got these great photos that you will treasure for a lifetime! Wow, life just keeps getting better for you! Now how are you going to top that!? I remember first hearing "Rapture" when it was played on General Hospital in Luke's Club back in 1981! And "Heart of Glass" was a song in my disco dance class in 1979! I love Debbie Harry too! 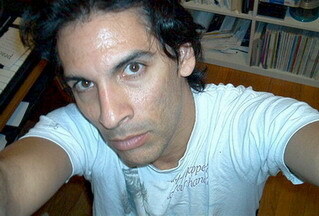 Hey, And don't think I didn't get "One way or another..." slipped inside that post! LOVE IT! Thanks for sharing! Wow - that is amazing! 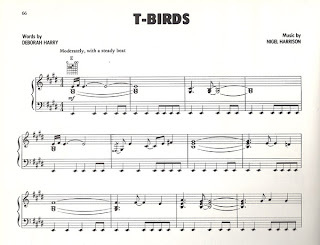 I am an elementary school teacher, and I can't imagine someone like that singing in our school! Great way to start of 2009 - Obama and Debbie! She wore this outfit when I saw her in Clevland with the Jazz Passengers quite a few years ago. Not to age myself or anything. Did you happen to ask Ms. Deborah anything about future projects or the new Blondie album? Breaking news puhleeze! is it true she only answers to "Deborah" Harry now? VERY cool. Did you tell her , "Your hair is beautiful!"? OMG! My head would have exploded. Glitter & feathers everywhere... I spoke with Debbie once when she was on "Rodney On The ROQ' here in Cali back during the "Debravation" era. I was soooo nervous, that I sounded like a 12-year old Marcia Brady trying to speak to Davey Jones. Congrats!!! You saw Debbie's and the Jazz Passengers at Blue's Alley with me. During intermission, you grabbed my hand and said, "Ok, we are going to act like we have to use the restroom, but we are going to walk into Debbie's dressing room." My initial reaction was, "What? Are you nuts, we will get kicked out." But, we both walked up, we walked right in to her dressing room, sat down on the couch and just started talking to her. I was dumbfounded. Then two other "fans" came in and asked about some obscure song and wanted to know what album it could be found. Debbie looked confused, like "how the hell am I suppose to remember that." You quickly saved her by saying, "It was never released as a single or on any album. It is only available on the London concert video which is hard to find these days." Then she shooed us out because "she had to use the restroom." LUCKY LUCKY you! I sooooooooo love her. Not just a diva but a good person, too! I am *so* jealous. I officially hate you now. Kidding, of course. Good for you. My one claim to fame is that Debbie cruised me at Balducci's 15 years ago. 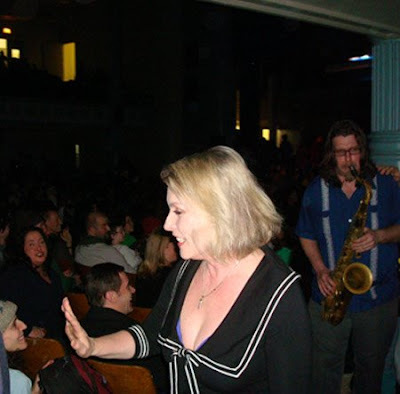 When I realized it was her behind those sunglasses and that scarf looking me all up and down, I nearly fell out - OMFG - that's Deborah Harry checking me out! If I wasn't carrying a huge smoked turkey at the time, I'd have chatted her up. Way more exciting than accidentally knocking Ivana Trump down whilst walking very quickly past the residential entrance of Trump Tower. *sudden overwhelming floral scent* Damn, I just knocked over Ivana. Damn, she's wearing a lot of makeup. CONGRATULATIONS!! I can only imagine what it must have felt like. I hope I have as much luck as you and get to meet some of my favorite icons. Very happy for you. LOL, I want to hear more about that Jazz Passengers invasion! The pic is great! The pic I have with her, she's pissed but it comes across as mysteeerious. And the time I met her when I actually got to converse with her, it was technically for work so would've been awkward. Love huh.